I have acrophobia. If that sounds alien to you, well, it actually means a fear of heights. Somehow, I don't think my phobia is that serious, but I do get dizzy when I am somewhere high looking down. Like on top of a building, or a mountain, or a bridge. So yesterday, I decided to face my fear. Yes, either I fight it or I allow it to haunt me for life! Well, I went to FRIM in Kepong. If you don't already know, there's a canopy walkway in the jungle at FRIM, which is like a suspended bridge about 150 metres long and about 30 metres above ground. Now, I am a lover of nature. I love the forests and the sound of wildlife around me. I love the smell of plants and I like to hear the sound of river flowing in the distance. That's the reason why I love to go FRIM to jog and to walk the jungle trails. Although I've been there many times, and passed by the canopy walkway each time, I have never tried going up the canopy before, probably because I have this fear of heights! Well, all that changed yesterday. I could not find anyone free to accompany me. It's a working day, by the way. Who in their right mind would follow me to go walking in the jungle and climb up a suspended bridge in the late morning? So I guess I had to face my fear all alone! No one to help me if I suddenly go paralysed with fear in the middle of the bridge! Boo hoo! Well, so be it! I arrived at FRIM at about 11.15am. After paying RM5 at the guardhouse, I drove my car inside. Oh, just driving along the road made me feel so relaxed. The vast greeneries seemed to welcome me with open heart. For a moment, I forgot about the canopy walk. Everytime I go to FRIM, I always thank God for the forests and the nature that God bestowed upon us. I don't understand why humans would want to cut down the trees and log the forests. It breaks my heart each time I see trees being chopped down in the name of development! After parking my car, I went straight to FRIM's One Stop Centre to purchase the ticket for the canopy walkway. After being briefed about the walkway, I registered and paid RM5 for the ticket. The lady told me the walkway will be closed by 2.30pm so I should not wait too long to go there. I left the One Stop Centre and walked a short distance to enter the Rover Tracks after passing the mosque. I often go jogging here, so this place was like my backyard to me. Here's how the Rover Track looks like, with greeneries all around. I really think my blood pressure drops a few notches when I am surrounded by these trees and plants! Somehow, I just feel so comfortable being with nature. After walking for about 900 metres, I reached an open space area where I saw this signboard directing the way to the Canopy Walkway. The steps you see are the beginning of the jungle trail. Inside the jungle trail, it was really shady as the trees blocked out most of the sunshine. You could hear sounds of animals and birds here. As I went deeper, the steps became steeper and it was getting harder to climb. In fact, when I first came here, it was physically demanding for me, and it still is, though I'm slightly fitter now. If you have never exercised before, you will definitely find the jungle trail a huge challenge! At one point, it was very steep and you just keep going up and up with no end in sight! If you have leg pain and heart problems, this may not be the place for you. But don't let me scare you! As long as you are quite healthy, you should give this jungle trail a try! It may leave you breathless, but you will be much fitter for it. Some parts of the trail had wooden planks on the ground as a small stream ran below the planks. I was in awe with some jungle sceneries here I just had to capture them on my handphone camera. Finally, after about 15 minutes climbing the steep jungle trail, I reached the entrance hut to the Canopy Walkway. I entered the hut and passed the ticket to the person in charge. As I stepped onto the suspended bridge, I could feel the fear coming. Somehow, I got to do this. And do it alone! To some people, this is no big deal. But to me, who have a fear of heights, it was a big deal. I held on tight to the ropes as I put my right foot forward. Will I make it? Find out in my next post coming right up! I have a fear of heights too but I am proud to say that I conquered the canopy walk..woohoo!! I do agree about being fit before attempting the climb up to reach the canopy walk. It is amazing and beautiful! I am proud of you for facing your fears. I am afraid of heights too! It's very brave of you to walk there despite your acrophobia. Reminds me the time we walked at the Mac Ritchie reservoir here in Singapore...don't you just love the smell of the forest? Hey, I like this place immediately! I have a fear of heights too but this will be an awesome experience. Nice. Been awhile since I last do any nature walk. Must do one soon, but maybe after the rainy season lah. Err... got pacat or not? not scared of mozzies eh? very brave of u to go thru it alone! congrats! Eyew...no, thank you! Anyway, I don;t think it can stand my weight! LOL!!! Love the nature too! I used to live in a city of jungle where the city was basically surrounded by a jungle. So cool! You've typed this story down here and said "...Well, all that changed yesterday. ", how would you not make it? though a bit scary, but i think that was fun walking on the canopy leh.. hahaha!! It was fun walking the canopy! I walked there a few times already... and nice FRIM pics u got there. I can't wait for your 2nd post! I'm also afraid of heights. I don't think I'll be able to keep my mind off the height. mei teng, really? Good! Next time I'll ask you to go canopy walking with me. Haha! nic, I went to Taman Pertanian before, but didn't know they have canopy walk too! Oh, I will keep that in mind and go there next time! How long is the canopy walk there? iamthewitch, thanks for having faith with me! Gosh, I better have more faith in myself! Haha! eastcoastlife, come and visit FRIM one of these days. If you love nature, you will love the place! And walking on the canopy is definitely a great experience! I am thinking of visiting Taman Negara in Pahang next - they have the longest canopy walkway in the world! lina, thank God, no! If I meet the same "guy" in FRIM, I'll die of fright! LOL! merryn, surprisingly no mosquitoes there! Actually I'm scared but won't allow that to stop me from taking photos! Haha! suituapui, wah you so heavy meh? Think should not be a problem. It can take quite a lot of weight. But to be safe, I think I better not be walking on the canopy if you are on it! LOL! rad, a city surrounded by jungle? I think I will definitely love staying in such a city! So you think I will make it? I hope so. Haha! SK, yeah it's fun and scary at the same time. Maybe it's scary that's why it was fun! LOL! angie tan, looks like a lot of bloggers are also afraid of height. And I thought I'm the only one! Haha! It looks like Penang Hill if you go hiking. Nature is always good... I love greeny environment a lot! Now you got FC too? Great! faisal, does it? I've been to Penang Hill and it's a nice place! Trekking is quite tiring but very rewarding. Walking around those towering trees and and all sort of plants is really nice. ayie, yes it is really rewarding and nice. We need to be with nature regularly. Staying in concrete buildings just isn't that healthy! Oh hey.. You're not alone.. I'm afraid of heights too..
That was why I didn't dare to take a flight until about 6 years ago.. But I think I'm getting better at it. I still have problems looking down though. But definitely much better than last time. Haven't been to FRIM, but did go to Bukit Cahaya in Shah Alam. Many of mine friends have acrophobia too! Wow, you're brave to go through that if you have a fear of heights. Great job Foong! In some countries, you can use a zip line to go through the jungle. Do you have that there? 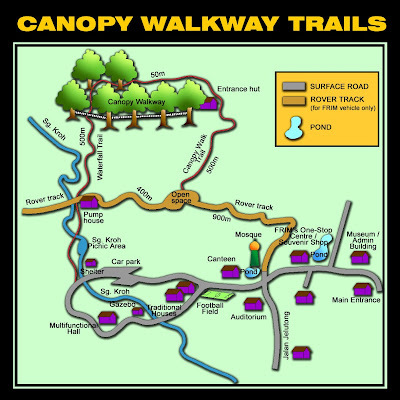 I have been there but did not go for the canopy walk. The bridge looks interesting... hmm.. I haven't been to FRIM but would love to someday. I understand there is a limit to the number of people on the Canopy Walkway at one time. I walked on one at Stone Mountain (think that's what it's called) in Kuching. That one is like three times broader than this one and is shaky. How is the one at FRIM? Foong, for practice nearer than Taman Negara, you might want to try the one at Sunway Lagoon or Gentings. It's nice to be able to get off work any time to go forest-trekking. Btw, are there many mosquitoes at FRIM? ooh... i have not been to frim. but would love to! That's really beautiful! I love the greeneries! I have to salute for trekking alone and even step on the suspension bridge! You are the man! Please post the part 2 as soon as possible! I love to see the pictures! cashmere, I'm afraid of heights but never afraid to take the plane. Maybe because inside the plane you don't really feel that you are so high up! I'm only afraid if it's an open area like the edge of a cliff or on a bridge or on a high balcony. Oh, I know about that one in Sunway Lagoon - scary!! I purposely go on a weekday, cos if go on weekend, there'll be a lot of people and I wouldn't want people to shake the bridge while I'm walking on it! Haha! robo, thanks! Actually I've been there many times so the jungle trail is no problem to me. Only afraid of the canopy walkway, but I guess I have to face it! oh now only I know there's a canopy walkway in Kepong!